The only way to get a 1994 Canary Yellow or 1994 Vibrant Red Mustang was to buy a Mustang GT. Canary Yellow and Vibrant Red were two colors reserved only for the Mustang GT coupe or Mustang GT convertible. There were two other reds available on Mustangs in 1994, but Canary Yellow was the only yellow available. The 30th anniversary, Mustang unveiled its new design. The hatchback was dead and the coupe was back but designed to appeal to the original fastback crowd as well. The side coves and side air scoops where back, as well as the horse on the grille. 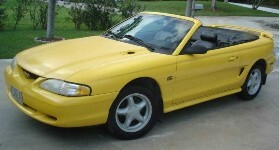 This is a 1994 Canary Yellow Mustang GT convertible with electronic fuel injected 215hp (302ci, 5.0 litter, V8) engine. The standard GT five-spoke, 15 inch alloy wheels are shown. This Vibrant Red Mustang GT is almost orange in the sun. It has a 215hp (at 4200 rpm), 5 liter (302 cubic inch), electronic fuel injected, V8 engine. This car has aftermarket Depo projector headlamps and side markers. Chrome (Canary) Yellow 1994 Mustang GT convertible owned by Roy T. Carter from Montgomery, Alabama. It has a 302ci engine and a manual transmission. Roy adds, "I worked at a dealership where it was traded in, and bought it before the ink was dry! Had it seven years. Main mods are Super Yellow Fog Lamps I built myself and 5-on-5 2005 GT wheels. Its a daily driver with 126k miles. It gets 17 in town and 25 highway." Teal 1994 Mustang GT convertible owned by Garry from Vancouver, BC, Canada. This was our featured Attitude Of The Week for the week starting September 18, 2011. It has a 5.0L V8 engine and a manual transmission. Garry purchased it as a lease return in 1998. Since then, he has added 3.55 gears, B&M shifter, K&N filter, and underdrive pulleys. Crystal White 1994 Mustang GT coupe owned by Walt Sonner from Grants Pass, Oregon. This is our featured Attitude Of The Week for the week starting August 31, 2014. Walt tells us more, "This was my son's car but he bought an 04 Mach 1 and parked the 94 GT. I got a deal from him and have been modding it ever since. He used to deliver pizza and Mexican food in it but it was pretty pristine when I got it. I have turned it into a Roush 360 Series Tribute car. I have installed the Roush front splitters and wing. I have the rear and side exit exhaust to go. It has a full Eibach Pro Kit suspension, MM subframes & adjustable LCAs, Magnapacks & BBK off road midpipe, staggered 17" DD Bullitts with 315/275 Sumitomos, Koni Sport Yellows adjustable rear shocks Steeda TriAx, Steeda CC plates, Bullitt/ Mach 1 13" brakes, Baer drilled & slotted rotors, new black reflector headlights Cobra style, and 3:55 Ford Racing Gears. Love this car and get so many kudos and even trophies at shows! A Coyote Swap in the future but now just a 95 Cobra intake and E303 cam, 65mm cobra throttle body, BBK CAI, and AFR 165 heads in the near future.."
Rio Red 1994 Mustang GT convertible owned by Chuck from Wiston-Salem, North Carolina. It has a 5.0L V8 engine and a manual transmission. Chuck shares, "I bought it from the original owner 2013. It has never been molested when I found it. I have done very little - exhaust, intake, shifter, anti-sway bars, wheels, and stereo. It's the closest I have ever come to driving a car from 1994 that feels like a new one." Crystal White 1994 Mustang GT coupe with a black interior and a DSS Racing 306ci pro bullet engine under the hood. It has a 6-speed manual transmission and a 3.55 geared rear. For suspension it has Steeda G-trac caster/camber plates, KYB GR2 shocks and struts, aftermarket big sway bars front & rear, non adjustable upper and lower control arms, and lowering springs. This is a 1994 Mustang GT coupe in the rare Iris purple exterior paint. In 1994 only 1304 of the 123,198 Mustangs sold was ordered with this color. This car has been modified with several aftermarket performance items. Bright Blue 1994 Mustang GT convertible with a black interior and white convertible power soft top. This car has the 5.0 liter 215 horsepower stock GT engine under the hood. This is an Opal Frost 1994 Mustang GT coupe with a nice gray leather interior. 1994 was the first year this WJ silver paint color was offered on the Mustang. This shade of silver continued through the 1996 Mustang model year. Do you like flames? How about these! This 1994 Mustang GT is painted with flames that look real. They are usually called "real flames". It looks like the car is actually on fire. This car was on display at the 2010 Mustang and Ford car show at Uftring Ford in East Peoria, Illinois. 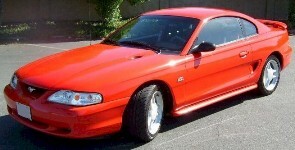 This Rio Red 1994 Mustang GT convertible has a awesome red and black leather interior. It was at the 2010 Mustang Roundup car show in Tampa, Florida.